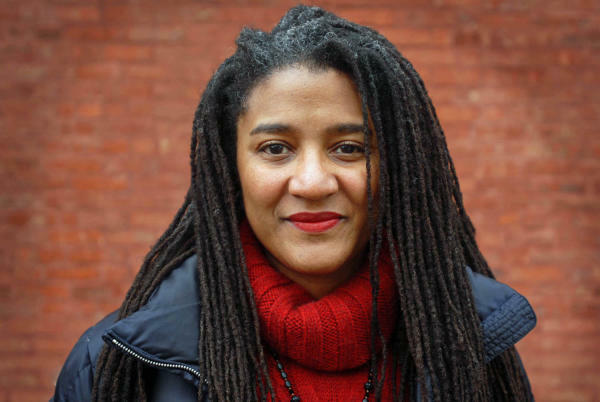 Lynn Nottage wins her second Pulitzer for SWEAT, a play commissioned and premiered by the Oregon Shakespeare Festival. We’ve known for a few years now, but this really drives it home: Oregon (Ashland, Oregon, to be specific) has become one of the great theatre centers of the world. Are you ready, theatre fans? In just a few short days and rain-soaked weeks, the 2016 season thunders forth at one of earth’s great theatres. Behold, way down in Oregon’s sunny south. You know the place of which I speak. The hamlet of Hamlet. Stratford-upon-Rogue. Broadway on Siskiyou. I’m talking about Oregon Shakespeare Festival. If you haven’t been lately to the mightiest theatre town of them all (ASHLAND, ORE-GONE), ye best hitch up the carriage and make haste. Pronto. Wondering when to go? Try opening weekend. Of course. This traditional kick off to the season is unique in the arts world. It’s like a three day blow out party with plenty of special events and star-studded local color. You’ll see old friends and make new ones. In addition to four shows and numerous panel discussions, you can go skiing to stay fit and order repeat affogatos at Mix to stay awake. OSF knows how to roll out the red carpet for opening weekend. And if you’re really lucky, the Cascade weather gods will roll out the white carpet – as pictured above in 2011. Here are some photos from past years. Saddle up, folks. It’s time for the annual rodeo! Lots of theatre journalists and critics went to Ashland this summer. The result has been a stream of stories on one of America’s visionary theatres. AD Bill Rauch and his team are creating big stuff in the little hamlet of Hamlet. Surely you have been down for a visit this year, yes? Talk of the town: What’s going on at OSF these days. If you’re a regional theatre, going to Broadway sounds like a dream. But unless you know what you’re doing, taking a show to the world’s toughest theatre market can play out more like a nightmare. It’s tough. And very few can pull it off. On paper, southern Oregon would seem an unlikely incubator IN THE EXTREME for Broadway buzz. 100 years ago, Ashland, Oregon was (to put it mildly) in the middle of nowhere. It still is. But today nowhere is somewhere – at least in the theatre world. And thanks to Angus Bowmer, a whole phalanx of succeeding individuals, and a good mix of sheer chance and historical luck, Oregon Shakespeare Festival has become a Broadway launching pad. Incredible but true. While it’s too soon to say for sure, another OSF-hatched American Revolutions world premiere may soon be headed for the world’s biggest stage. According to the all-knowing New York Post columnist Michael Riedel, SWEAT by Lynn Nottage “…will likely wind up in New York early next year.” Riedel says it’s going to the Public first before considering a leap to Midtown. When a live performance event is good, they’ve gotta have it. They = the audience. When it’s good, whatever “it” is, they, the audience, come from over hill and dale. They come because they must have this experience. Because there’s nothing else like live performance. When it’s good. We’re used to people camping night and day for tickets to see The Who or The Grateful Dead or Wilco or the Seahawks. But theatre does not usually see such pandemonium. Unless it’s Hamilton. 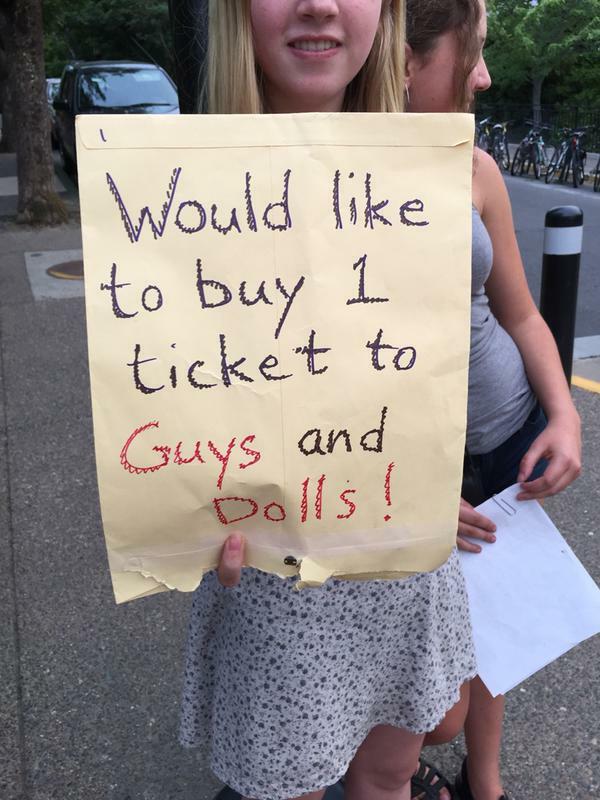 If you’ve hit the Bricks in Ashland lately, you may have noticed scores of people with signs waiting outside theatres trying to find a ticket – any ticket. 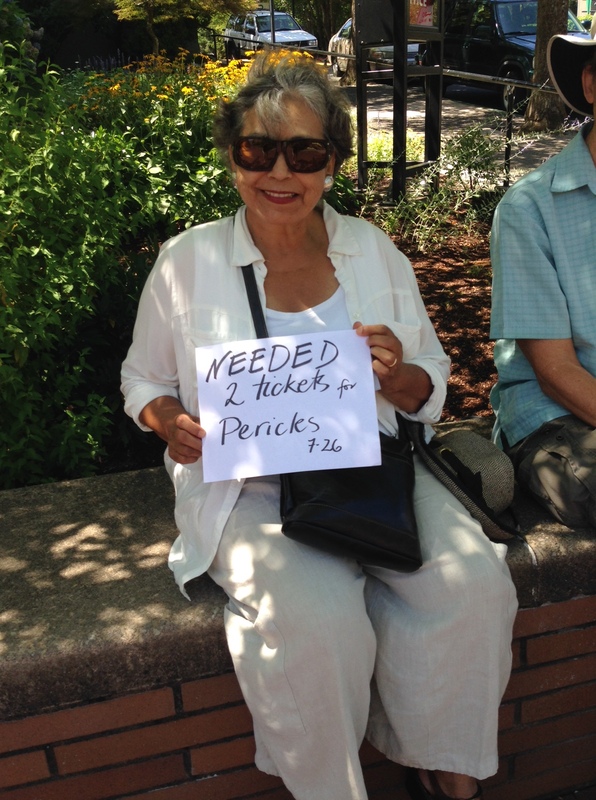 In fact, the impulse to make a “Tickets wanted” sign is now such a normal part of the daily routine in Ashland that the OSF box office is making signs for people! Now that’s service. This is good. This is how it should be. A ticket to see David Kelly or Miriam Laube or Kimberly Scott or Kevin Kenerly live in Ashland should be in demand. BIG TIME. Because there is nothing else like this. This is the show you have been waiting for. When it’s good, the only crisis of the American theatre today is how can we fit more people in the room, where will they all sleep, where will they all wait in line and not block traffic, and is there enough food in town to feed them? They’ve gotta have it. And this summer in Ashland, they’re coming for it. One of the lovely signs made by OSF staff. At this point, they probably reuse them daily. Because Pericles is SOLD OUT!! 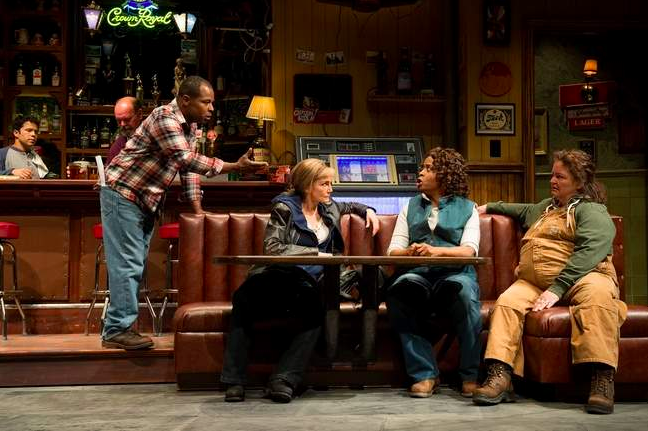 When SWEAT, the new play by Lynn Nottage getting its world premiere at Oregon Shakespeare Festival, is gone, Reading (pronounced “red-ing”), Pennsylvania will still be there. Nottage has spent several years visiting Reading gathering material for her play. But she did not want that to be the end of a heightened focus on de-industrializing American towns. To continue the dialog and also give something back to the town, Nottage has created The Reading Project (again pronounced “red-ing as in the town), a collaboration between Market Road Films, which is run by Nottage and Tony Gerber, and New York’s Labyrinth Theatre Company. So far you can see a few videos on Market Road Films’ Vimeo that feature some of the voices Nottage heard on her trips to Reading. But there’s more coming up. And you know with Nottage and Labyrinth involved, you’re going to want to see what they come up with. So watch this space. A new American play is coming for you. SWEAT by Lynn Nottage. Photo: Jenny Graham. Y’all ready to sweat a little, Ashland, Oregon? I hope so. Because it’s going to be hotter than hell in the Rogue Valley on Wednesday. And I’m not talking about the weather. That’s right. Even though the forecast is calling for 104, there’s going to be something even hotter than that going on beneath the glare of the mid day fire ball on the Bricks in downtown Ashland tomorrow. And that’s the first preview of the world premiere of SWEAT by Lynn Nottage in the Angus Bowmer Theatre at 1:30 PM. Despite the temperature, just writing that last sentence there sends a cold sweat down my back. Hoo boy. If I could rub Aladdin’s lamp and be granted one wish to be anywhere on earth in any theatre there is seeing any show imaginable tomorrow – I’d be right here in Ashland. No question. If you’re a theatre fan, and especially if you’re an Oregon theatre fan, there is simply nowhere else to be on Wednesday. Or Friday and Saturday for the next two previews. Or Sunday for the official opening. Or anytime during the next three months as SWEAT runs in rep at OSF. A new play by one of America’s leading playwrights at one of America’s (and the world’s) great theatres – which just happens to be right here in Oregon? Hello?? That’s like a Ducks game in Autzen Stadium or Sleater-Kinney at the Crystal Ballroom or the Pendleton Roundup on Saturday night (including a bonus visit to the Let’Er Buck Room). It’s BIG stuff. The biggest. In the American theatre today, it doesn’t get much more exciting than a new play by Lynn Nottage. Especially this play. In this place. At this time. Whaaaaaaaaaat?? Yeah – see? You with me? If I didn’t have your attention before, surely I do now. I don’t know about you, but I’d be pretty happy to just sit in the audience and see that group walk out on stage and stand there and do nothing. But they’re going to do a lot more than that. It sounds like their task is nothing less than acting out a new story of and for our time. If the past is prologue, look for this show to sell out once the news hits the wire. Remember what happened to ALL THE WAY and THE GREAT SOCIETY? While there will be other chances to see SWEAT at other theatres later on – no production is ever going to be better than this original one on the home field. It’s only on for three months as it is. Only a few thousand people can see it. And you definitely want to be one of them. So buckle down, Ashland. And get ready. Maybe bring a fan or an ice cube or something. Because the drama is coming. And it’s going to be hot stuff indeed. Hot stuff. SWEAT by Lynn Nottage runs July 29 – October 31 in the Bowmer Theatre at OSF. Very little rings true here. From mountain of sub plots, current day events and social/familial themes, nothing much of substance is milled. Many familiar pitfalls of new play dramaturgy on display: over use of technology, fascination with social media, too many cuts. Bonus: Implausible homeless guy with heart of gold. Because it’s time for the show. Ever since it was announced on March 14, 2014 that a new play by Lynn Nottage would be coming to Oregon Shakespeare Festival in 2015, I’ve been counting down the days. A new play by this savvy and supremely human writer is a cause for celebration – even when the material she may be dealing with is some of the toughest and heaviest there is. If you saw RUINED at OSF in 2010, you know what I’m talking about – the kind of unbearable heightened intensity that a playwright like Nottage can imprint into your brain. Forever. The kind of drama so real and powerful it caused an audience member to jump on stage to try to stop what was happening. Well, she’s at it again and the project this time sounds about as relevant and important as it could possibly be. The countdown until opening night is rapidly dwindling toward 0. And the closer it gets, the better it sounds. Here’s an interview with the Brooklynite from American Theatre. You REALLY want to read that. Then get your tickets for one of this year’s highlights in the American theatre. Right here in Ore-gone. And prepare to be reminded what theatre can be. This woman. Lynn Nottage has a new play for you. It all starts 7/29 at Oregon Shakespeare Festival. Unwatchably dull. Stan Lai’s supposedly genius work of modern Chinese drama, rendered here in English, feels like a thrown together improv of extremely gentle, old-fashioned (and boring) commentary. Mystifyingly, the reign of terror in China that takes place during the play’s time period (1948-1988) passes entirely under the radar. While obviously safe and soft enough to attract the interest and approval of official Chinese media, as well as become one of the most popular plays in China today, the drama-free SECRET LOVE is going to teach American audiences not much about China. The program and educational materials for this show are filled with cultural, historical and literary references galore that the play supposedly draws on and engages, but the main problem here is that SECRET LOVE itself contains not a thing of consequence – at least for a non Chinese viewer not versed in all the source material and history. For long time consumers of new plays, it’s a familiar syndrome that when a playwright is running short on material, they often go meta on us. You’ve seen these plays. One minute the play is on, the next minute characters are breaking the fourth wall and joking about the actual business of making theatre, rehearsing, dealing with the playwright, etc. For the mainstream audience, these moments can definitely draw a laugh. “Oh my god! Look the play has stopped!” But usually such throw away bits of silliness serve to distract us from the fact that the main event – the story on offer – is weak and the playwright is looking for something, anything, to pad the run time. That is not to say that there are not many important plays throughout the ages that mess with the official play structure. But the best of those are often dealing centrally with some aspect of how narrative or reality are made. These plays are not breaking the fourth wall because there’s nothing else to do. They’re doing it because the nature of that fourth wall is itself a main concern of the play. For playwrights with a real story to tell, there is no time for inside jokes about theatre or desire to break the frame and weaken the subject of their focus. There would be no reason for Lorraine Hansberry to weaken RAISIN by stopping the action to let us in on a rehearsal of the play, no reason for Ping Chong to halt the action of THRONE OF BLOOD to reveal a funny disagreement among actors about their personal lives or a fight with the director over what’s for lunch, no reason for August Wilson to show us the making of JOE TURNER’S COME AND GONE – when the real JOE TURNER itself is all we need. The story such as it is concerns two different theatre troupes trying to rehearse two different plays in the actual Angus Bowmer Theatre – the very one we’re sitting in!!! Sometimes stage reality is so real, people. Somehow owing to a scheduling flub, both groups think they have the space today, and so they go back and forth trying to work in bits of the two plays while the fight for time becomes more acute. Eventually (in the single most enjoyable moment of the play for me) Tony “Harry the Horse” DeBruno arrives as an OSF operations manager to try to clear the melee from the theater. Anyone who has a problem can “call Susan in the office”. Now, for Ashland devotees there is some fun in this real world setting. Local names and places are used. Arguing theatre people clamor to “call Bill” to straighten all this out. But such thrills of recognition soon pass, and none of this has any bearing on the actual story – other than to help disguise the fact that there isn’t much of a story. As we’re in a straight up realer than real reality, you can’t help wondering about the gaping holes in the setup. How could two different Chinese-themed plays be scheduled for the same time to rehearse in the Bowmer? Who are these people and how did they get here? Do they not know each other? Are they part of the normal OSF acting company doing another show on the side? Outsider people? Are they traveling the earth looking for somewhere to put on a show? We don’t know. Don’t think too hard about any of these questions, because after about five seconds of scrutiny the entire framing conceit of the play makes little sense, and it’s hard to understand why so much effort was thus expended setting it up. You would think it could work better if the rehearsal room were, say, in Taiwan or China, where perhaps a more plausible reason for the scheduling error (one with some political context?) could have easily been manufactured. Dramatically, the idea of two different stories competing for dominance is extremely promising. But here it’s freighted with no larger consequence. One of the stories follows a young couple about to be torn apart by the communist revolution in 1949 Shanghai, and the aftermath 40 years later as the man lies dying in a hospital bed in Taiwan, remembering his young love. The other is a traditional fairy tale about a fisherman whose wife is unfaithful. There are themes here (as we’re told exhaustively in related materials and coverage) of exile and the longing for home, love and loss, etc. But none of that gets dramatized very effectively. There is some gorgeous pageantry, movement and sound, particularly for the older story. Eugene Ma as the enraged, befuddled fisherman is simply hilarious and an extremely gifted physical presence. But no amount of top notch ingredients, technical capability and scores of talented actors can disguise the fact there’s not much of a there there – er – here. If only all these resources could be marshaled to tell a clear story with something at stake. In SECRET LOVE, we’re told we’re witnessing some classic work of the Chinese stage, but many audience members may simply leave scratching their heads. There seems to be an excess of respect for Lai and not enough critical appraisal. I’m not familiar with his earlier work, but certainly given how meager the play at hand is, it seems weird that his presence at OSF should be the cause of such reverence. Lai practically had minders sweeping the ground in front of him with palm fronds on the OSF campus. There’s a certain complacency in evidence here, where the audience is told over and over how important and revered Lai is, as if that should be good enough for us. What would serve everyone much better is some work on the stage that calls for actual reverence (like THRONE OF BLOOD a few years back, to recall another recent international work), instead of the cobbled together and highly forgettable piece we got. Also, the complete absence of any mention of what went on during those 40 years of cheery communist rule that separated our young lovers (when however many gazillion people died) would seem to be a problem and a serious challenge to Lai’s stature as a critical, independent artist. I’m hardly a China expert, but I have to think that if your work is popular or tolerated by a regime whose M.O. is jailing dissident voices, it MIGHT mean your point of view isn’t very sharp. I did find this comment by crack reviewer Lincoln Kaye who has known Lai and his work for 25 years, which gets at my hunch here: “Compared with his brilliant innovations back then [25 years ago], the current production — especially in English translation — seems the anodyne work of an established theatrical celebrity struggling to surf the treacherous shoals of China-Taiwan-U.S. cultural diplomacy.” Bingo. All in all, worth seeing perhaps for the costumes and traditional styles used at times, but the show does not hang together as a coherent piece, and it’s hard to imagine it traveling very far beyond Ashland.